A bed to chair transfer can be achieved with many different types of equipment. There are Hoyer lifts, bed rails, patient lifts, transfer boards, and trapeze bars that all do this task. The user’s strength and ability determines the type of equipment they require. 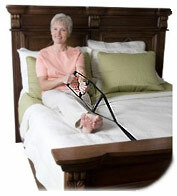 A bed to chair transfer can be easily maneuvered with the assistance of a lift. Many users of Hoyer lifts are not completely bed ridden, but may have a debilitating illness that causes extreme weakness. They may also suffer from being paralyzed, thus making it very difficult for them to transfer from their bed to a chair or wheelchair. 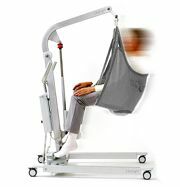 The most common type of bed to chair transfer lift is rather large, on wheels for easy moving, and runs by hydraulics. The lift has straps that attach to a washable, sturdy canvas pad that the patient sits or lays on while being transferred. There are older types of lifts available that do not use hydraulics and are cranked by hand. They are basically the same as the newer models, although somewhat harder to use because of the physical exertion of the hand crank method. For caregivers or nurses who require transfer assistance from a bed to a chair, the use of a patient lift or Hoyer lift works the best, especially for patients who are unable to provide their own assistance in the transfer. For someone with upper body strength, they can use transfer boards, trapeze bars and bed rails for independent transferring. The transfer boards allow the user to slide slowly into a wheelchair. The trapeze bars and bed rails for elderly act as stability bars to lift themselves off the bed and move at their own rate of transfer. 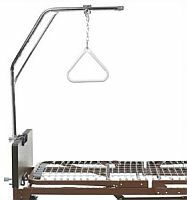 You can put a free standing trapeze bar hovering above the bed or have an attached trapeze bar hang over the bed for disabled persons to pull themselves into position for resting, sitting or transferring without much or any assistance from caregivers. Let the patient move with their own strength if they are capable. Doing this will allow the patient to move at their own speed and reduce the amount of physical stress on your back. Make sure you are wearing nonslip shoes or slippers. Put on the wheelchair brakes. Set aside the wheelchair footrests so it does not interfere with the bed transfer. Lower the handicap bed height and clear the area of any obstructions. Place your arm under their shoulder and use your other arm to swing their legs to the side of the bed. Put your arms around their torso and tell them to push off the bed, moving towards the wheelchair. Tell them to use the bed edge and the armrests on the chair for stability as they move. These transfer techniques apply for someone without bed lifts or other assisting devices. When you are trying to get out of bed and require assistance, the best solution would be a handicapped style chair that gets you out of bed by lifting your body up. Fortunately, there are adjustable beds and bed lifting devices that can lower and raise your bed mattress according to your height and angle preference. Handicap Bed Straps – These affordable bed devices are great for maneuvering around the bed and pulling yourself up to an upright sitting or seated position. 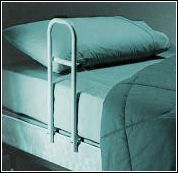 Bed to chair transfer equipment is often times paid for by the person’s insurance company. If the physician deems it necessary for the patient to have this type of bed to chair transfer equipment installed in their home it is usually covered by most health insurance plans. If the person does not have any medical coverage or only a very small amount, the affordable options are the transfer boards and transfer bed rails which can be priced under $50 to $100. Trapeze bars and base are the next highest in price ranging from $150 to $200. 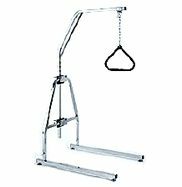 The Hoyer lifts are the most expensive items for transfer equipment and can cost upwards of $1500 and more. As you go up in price, the weight limits also move up. To the left are transfer boards that can be used for a wheelchair to bed slide. The patient simply sits on one end and slides across the transfer board. Slicker bed transfer boards work better as bed sliders. Those that benefit from the different types of bed to chair transfer equipment machines are those who cannot get out of bed easily on their own, and have no family member or friends that are available when needed to do the transfer.